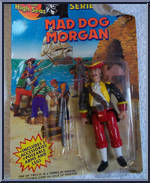 Mad Dog Morgan included a spyglass and cutlass and was accompanied by his pet falcon. Contribute pictures, update details or suggest corrections for Mad Dog Morgan. Write a review about Mad Dog Morgan. I would love to find this figure!